We all have fond childhood memories of tree swings. Whether it was yours or that of a friend, the freedom and fun offered by a tree swing is undoubtedly one of the most cherished of childhood memories. 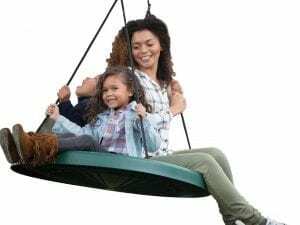 If you decide to give your kid or family such a timeless gift, this 2019 top 10 tree swing review has all the information you need, to make your purchase a success. With an 18-inch width, this Magic Tree swing is designed to replicate the swings of the good old days. Crafted from natural pine, it is quite simple, and yet, quite functional. The rope is made from Nylon and will last for a long time to come. 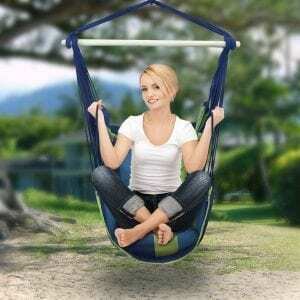 This swing can be used both indoors and outdoors, for recreation or even as decoration. Installation is simple and quick, and you don’t need tools. 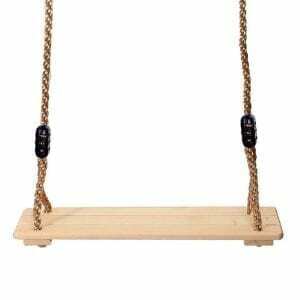 The length of the rope is adjustable, and this swing has a maximum weight capacity of 200 lbs. (90kg). It comes with a storage bag, which makes it easy to pack it up and take it with you on a camping trip, picnicking or any other family getaway. Highlights: Made from natural pine, durable and robust Nylon ropes, simple installation. The Swurfer skateboard swing is a unique and very creative approach to tree swings. With utilizing the curves of a skateboard, the Swurfer board offers stability and strength. Inspired by surfboards, it offers the thrills of skating or surfing, but in a controlled environment. 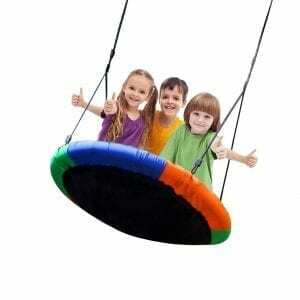 It is suitable for both kids and adults, supporting a maximum weight of 250 lbs. (113kg). The rope is UV and mildew resistant, while the board measures 33 x 10 inches. 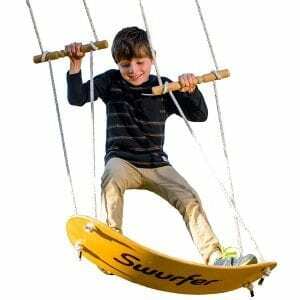 Two handles attached to the double braided ropes make the Swurfer a swing that you can also stand on, allowing you to swing in standing while holding on to the handles. The rigorous movements and the constant struggle for balance, make this a very efficient way to exercise. Highlights: Unique & trendy design, easy install, supports up to 250 lbs. Measuring 30 inches in diameter, this swing can hold weights up to 400 lbs. (180kg). 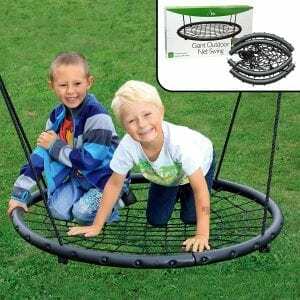 It features extra-thick ropes with adjustable heights and comes fully assembled. The frame is made from steel, which makes it very durable. The material is permeable, allowing water to completely drain-off. This swing is additionally supported with a 1-year manufacturer’s warranty, which can be increased to 2 if you register online. 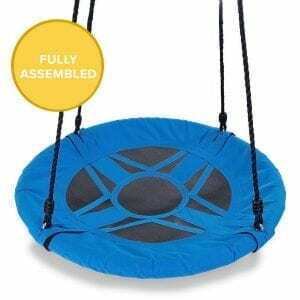 It comes with 2 carabiners, although it requires a hanging kit, when fully installed, you get a wide, durable, and fantastic spinning swing. Highlights: Carries up to 400 lbs., comes fully assembled, easy to install, 2-year warranty. With a 39-inch (1m) diameter, this M & M’s Web Riderz swing is designed for kids, teenagers and adults alike. This makes it a perfect swing for the whole family. Built on a large steel frame, you can rest assured that it will last. Its maximum rated weight capacity of 600 lbs. (270kg) allows as many as 3 to 4 persons to play with it simultaneously. You can swing with it, as well as spin it. It’s hanging ropes are also adjustable, allowing for a proper height setting. M & M delivers it fully assembled inside the package, and you just need to hang it. The ropes are made from Polyethylene and are UV-resistant, while the steel tube frame is powder coated, both features, guaranteeing a long life outdoors. Highlights: 39-inch diameter, 600 lbs. maximum weight capacity, adjustable ropes. The bright and colorful fabric of this swing makes it a natural magnet for children. It is a 600D Oxford fabric, which is very strong and will last a long time. Strong straps connect this cover to the steel frame, making the entire construction very sturdy and durable. With a 40-inch diameter, Blue Island designed this swing to offer enough space for many kids. It also allows for standing, sitting and lying down. This makes it a very memorable item, which your kids will continue to cherish, long after they have become adults. The package includes easy-to-follow assembly instructions, and Blue Island backs it up with a 100%, no questions asked, Money-Back-Guarantee. Highlights: Easy installation, large and durable frame & fabric, 100% money-back guarantee. This swing combines the best features from different devices like hammocks, swings and cushioned chairs, to produce a truly unique and lovable item. The Sorbus swing will hang like most other swings, either from a tree branch or on the balcony. Also, it is designed to be very comfortable for all kids. It includes pillows, soft but durable fabric, and a design that enables it to offer you the comfort of a plush lounging chair. This Hammock-Swing is designed for people of all ages, and who weigh up to 265 lbs. (120kg). 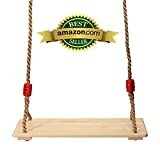 As an amazing conception, this swing will offer you and your family a most cherished spot to sink into your favorite books, magazines or website on a tab. Highlights: Hangs anywhere, super comfortable, suitable for all age groups, includes pillows. This swing features a 112 inches long rope, which attaches to the high-density molded polyethylene disc, and holds weights up to 120 lbs. There is also an included metal ring to make the attachment easy. Recommended for kids aged 3 and above, this 12-inch wide disc is colorful and bright, as well as portable. It is easy to install, but also easy to take down and take along with you wherever you wish, like picnics, a jungle gym, camping, or any other place you might feel like. Highlights: Versatile swing, sturdy and long-lasting, hold weights up to 120 lbs. The net design makes this swing extra-fun to play with. It can easily hold 2 kids, with a combined weight of up to 200 lbs. (90kg). This swing is also easily disassembled, either for storage or for transportation. This allows you to take it along for camping, picnicking or on any other family adventures. The frame is made of steel and covered with foam, making it sturdy, and yet safe to play with. Its 40 inches width also makes it quite spacious. The package includes the swing with the net, a hanging ring, adjustment ring, and the hanging rope. Highlights: For 2 kids, holds up to 220 lbs., large and fun, easy to disassemble for storage. When you need a top quality swing for the whole family, then take a closer look at this swing. The Super Duper is the ultimate swing, designed to hold your kids and their friends simultaneously. They can swing and spin, without safety fears, because it holds up to 650 lbs. (300kg). The seat is 40 inches wide and sturdy, while the ropes are made from military-grade Nylon. This allows 3 to 4 persons, including adults, to find enough space on this swing simultaneously. You will need to select a tree branch that can handle this weight carefully, but once done, the whole family can ride at once. This package also includes safety locking clips, a high-quality hanging kit, and a user guide. Highlights: Holds up to 650 lbs., includes 10-ft. hanging kit, adjustable ropes. The Super Spinner is designed to provide enough sitting and playing space for your kids. With its 27-inch diameter and solid seat design, your kids can swing and spin for as long as they like. It is designed for kids from the age of 3 upwards and will accommodate weights up to 200 lbs. (90kg). This means up to 2 or 3 little kids will find enough space on this swing. The package includes heavy-duty locking clips and a fully adjustable 10-ft. tree hanging kit, which includes stainless steel rope adjusters. Super Spinner’s seat even features a patented design, which provides a safer and more comfortable play environment for the little ones. Highlights: Extra-strong polypropylene rope, quick & easy installation, 2-year warranty. There are many preliminary considerations to make before purchasing and installing a tree swing. Although different homes, gardens, and trees may require special considerations, the following are general tips that everyone can profit from. Maximum Weight: Every tree swing has a maximum weight based on the materials it was built on. While most swings are designed for just one person, some swings are designed for 2 or more people. When you decide on the maximum number of people to use the tree swing, you can then focus on a product that fits your requirements. Rope Length & Adjustability: You should know how tall the tree’s branch is from the ground. This allows you to make sure that the swing’s rope is long enough to reach down to about 2 ft. from the ground. If the rope is too long, then there’s no problem, but a too-short rope creates many problems. It’s also worth checking that any particular swing offers a way to adjust its rope’s length. 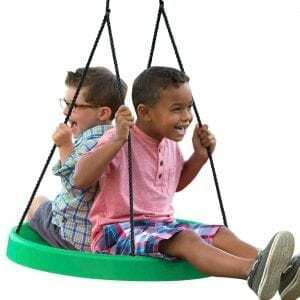 Design & Style: There are many different types of tree swings, from the classic wooden swing, to tire swings, to modern swings made from hard plastic and those made from mesh and polypropylene fabrics. There are swings designed for just one person, and those designed for 2, 3, 4 or even more people. The final decision here rests on you, based on what you need. Durability: The purchase of a swing is an investment in your family’s happiness. To be a good investment, you have to see to it that the swing is as durable as possible. This means that it should be made from good suitable materials that last long, as well as made by a good manufacturer that values safety and durability. 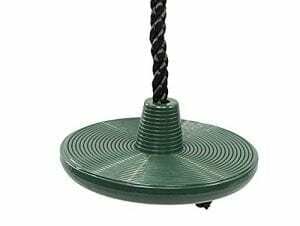 Hanging Kit vs. Ropes: While it is possible to hang a swing on a tree with just ropes, a special kit, called a swing hanging kit, does offer better value. By installing your swing using a hanging kit, you can easily unclip the carabiners and have the swing removed. If you had to tie ropes, untying those ropes is often a lot of work. Secondly, hanging kits are made from wide Nylon straps. Being much wider than ropes, these straps prevent your tree’s branch from being damaged, unlike when ropes are used. Some swings come with hanging kits, while others don’t. Extras: Asides from the swing itself, there are many extras that can be added to increase the fun. Such extras include swing swivels, which can be installed to create rotating swings. Others include spring swings that can bounce up and down. One could also personalize the swing with a name-tag or special attachment to make it the perfect gift. Price: Of course you should only buy things that you can really afford. Having a budget makes you a more disciplined shopper or investor. So, set a budget first, and then focus on swings within your budget. Swings can cost anything from under $50, up to $100, or many hundreds of dollars. We have reached the end of this top 10 tree swings review for 2019. As you have seen, there are different tree swing designs, with various capacities and prices. The turn is yours now to make a choice, and whichever swing you may choose, we wish you and your family, fun, and happiness with it.